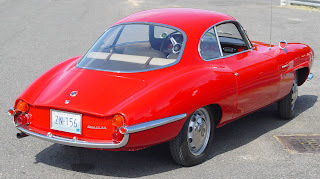 The Alfa Romeo Giulietta Sprint Speciale and Alfa Romeo Giulia Sprint Speciale (both 101-series) (also known as the Giulia SS) are small sports cars manufactured by Alfa Romeo from 1959 to 1966. The first prototype of the Giulietta SS was presented in 1957 at the Turin Motor Show. After two more prototypes were presented in car shows, the official presentation of the production version for the press was on 24 June 1959 on the Monza race track. First 101 cars produced had "low nose" and 750SS designation. 100 cars minimum were needed to homologate a car in FIA regulations. All these cars had steel bodies with aluminium trunk, hood and doors. Also first cars were equipped with Weber 40 DCO3 carburetors, later changed to 40 DCOE2. There were some all-aluminium cars produced. The drag coefficient of the Sprint Speciale is 0.28, the same as a Corvette C6, and was not improved for more than 20 years. Cars used the 1,290cc Alfa Romeo Twin Cam engine, a design with hemispheric combustion chambers and valves controlled directly by twin overhead camshafts. The Sprint Speciale was a real race car to compete with the Porsche 356. It has a front engine with rear wheel drive. Small changes to a production version included steel doors, Weber 40 DCOE2 carburetors, higher front nose, removal of plexiglas windows. Bumpers were fitted front and rear, also cars had some minimal sound-proofing. With the 1,290cc engine and 100 hp (75 kW) of power the maximum speed was around 200 km/h (120 mph). The 1300 cc engine and gearbox was the same as used in race-oriented Giulietta Sprint Zagato. All Giuliettas SS had 3-shoe drum brakes at front wheels and drum brakes at the rear. Export versions had 101.17 designation. Side badges had "Giulietta Sprint Speciale" script. 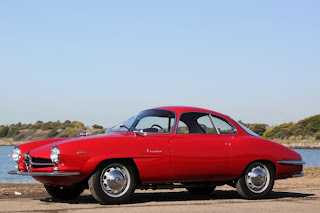 There was a prototype by Bertone of a replacement for Giulietta SS, named Giulia SS Prototipo, but the new shape did not enter production and the next generation Giulia SS was carried with an unchanged Giulietta SS body. The bigger engine 1.6 L Giulia series replaced the Giulietta and was introduced in March 1963 Autosalon Geneva. 'Giulietta' means 'little Giulia' in Italian, Giulia was a wordplay, claiming the new car was a grown-up version of the Giulietta. In spite of a Giulia SS prototype, Alfa Romeo decided to retain the Giulietta-shaped SS in production. The 1,570cc engine made up to 200 km/h (120 mph) possible. The 1,570cc engine with Weber 40 DCOE2 carburetors was taken from Giulia Sprint Veloce and delivered 112 hp (84 kW) of power. Most Giulias SS had disc brakes at front wheels. An easy way to distinguish the Giulia SS from the Giulietta SS is by the dashboard. The Giulia has a leather underside with the glovebox at a different angle than the main fascia. The dashboard in the Giulietta is sloping and painted in one colour without a leather underside. Side badges had "Giulia SS" script. Production ended in 1966. 1,366 Giulietta Sprint Speciale and 1,400 Giulia Sprint Speciale were produced. 25 cars were converted to right hand drive by RuddSpeed. Last updated on 21 April 2014 at 16:44.